Vaccination is a controversial topic with chiropractors because of our non-drug and non-surgery approach to health. This section attempts to present both sides of the vaccination issue. Those statistics are total rubbish! The Centers for Disease Control (CDC) compiles yearly death rates, categorizing all deaths by cause. During the year 2002, the ACTUAL number of deaths attributed to influenza was only 753. (See p.16 and the table below) AND... almost all of those deaths occurred in people over the age of 75, in individuals who had pre-existing serious health conditions, AND weakened immune systems. Accurate statistical analyses are complicated by the fact that the diagnostic codes, which classify diseases (known as “ICD–9 codes”) lump flu and pneumonia together in the same sub-section. This *could* be why ACP made their mistake, although I seriously doubt it. 3,454 Americans died from malnutrition — 13 times as many people! Even more upsetting is a study published in 2005 by Lone Simonsen, Ph.D., and his team at the National Institute of Allergy and Infectious Disease at the National Institutes For Health (NIH). Please do NOT dismiss this as an *anti-vaccination* posting. There is no doubt that vaccinations for polio and smallpox has saved millions of lives. When it comes to vaccinating against nuisance illnesses, I believe that the risk-to-benefit ratio is so vastly reduced that we must look more closely at the actual benefits versus the health risks. This collection of medical citations presented by Dan Murphy, DC demonstrates that early exposure to antibiotic use and Pertussis vaccination contribute to the development of atopic disorders such as asthma, and hay fever, and may also be associated with the onset of pediatric lymphoblastic leukemia. Our thanks to the American Journal of Clinical Chiropractic for releasing this article exclusively at Chiro.Org! The Vaccine Adverse Event Reporting System (VAERS) is a Cooperative Program for Vaccine Safety of the Food and Drug Administration (FDA) and the Centers for Disease Control and Prevention (CDC). VAERS is a post-marketing safety surveillance program, collecting information about adverse events (side effects) that occur after the administration of US licensed vaccines. Reports are welcome from all concerned individuals: patients, parents, health care providers, pharmacists, and vaccine manufacturers. Pregnant women and children younger than 3 in California will soon no longer receive vaccines containing more than a trace of mercury, under a law approved this week. Vaccines for those groups will contain no more than a trace of thimerosal (termed thimerosal-free in the industry)—a preservative in some vaccines that contains ethyl mercury. The law takes effect in July 2006, according to news services. A leading national physician organization [American Physicians and Surgeons (AAPS)] is calling for a moratorium on all government mandated vaccines and has passed a resolution to that end at their annual meeting. The members of the Association voted this week at their 57th Annual Meeting in St. Louis to pass a resolution calling for an end to mandatory childhood vaccines. The resolution passed without a single "no" vote. "Our children face the possibility of death or serious long-term adverse effects from mandated vaccines that aren't necessary or that have very limited benefits," said Jane M. Orient, MD, AAPS Executive Director. You may want to review their Resolution Concerning Mandatory Vaccines. You may also want to review their Fact Sheet on Mandatory Vaccination. Who Will Pay for the Adverse Events Resulting From Smallpox Vaccination? This paper summarizes liability and compensation concerns surrounding the smallpox vaccination program announced by President Bush on December 13, 2002. The paper examines the nature of adverse health events that are likely to occur in connection with the smallpox vaccine, assesses the liability protections that have been established for organizations and individuals participating in the vaccination program, and discusses the compensation mechanisms being considered to address the damages incurred by volunteers who may suffer from adverse vaccine reactions. Specifically, the implications of the Federal Tort Claims Act, workers' compensation programs, and the creation of a new no-fault compensation fund are explored. Vaccine Extraimmunization - Too Much of a Good Thing? The article by Feikema and colleagues in this issue of JAMA suggests that extraimmunization of children occurs considerably more often than previously appreciated. Using data from the National Immunization Survey, Feikema et al examined the immunization histories of more than 22,000 children aged between 19 and 35 months. 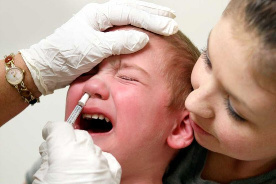 According to the handout that the federal Centers for Disease Control requires pediatricians to provide parents, the complications from DPT shots are these: 1 in 100 DPT shots will provoke prolonged crying or high fever in an infant; 1 in 1,700 will cause a brief seizure or state of shock. Over the decades, several hundred million pertussis shots have been given around the world – today, nearly 90 percent of American 2-year-olds have been immunized – but there still is no agreement on the graver reactions to the vaccine. The literature has recorded hundreds of instances – perhaps 1 in every 300,000 shots – in which children died within a few days of a DPT shot, or suffered recurring seizures that brought on retardation or other chronic brain damage. We provide information on vaccines, and the immunization policies and practices that affect the children and adults of Texas. Our mission is to prevent vaccine injury and death and to promote and protect the right of every person to make informed independent vaccination decisions for themselves and their families. A parent's right to choose what's best for their child...some would say that this is one of the most basic rules of any civilised society. Yet governments all over the world have abridged or denied the right to free choice when it comes to vaccination for our children or ourselves. The Australian Vaccination Network is working to help parents take back that right to free and informed choice by allowing them to see both sides of this issue before making a decision. WHO is committed to: (a) To ensure the quality and safety of vaccines and other biological medicines through the development and establishment of global norms and standards, (b) To assess the strategies and activities for reducing morbidity and mortality of vaccine-preventable diseases (VPDs), and (c) To reduce financial and technical barriers to the introduction of new and existing vaccines and immunization-related technologies.